I've not done any sort of nail art in ages and as it's October and nearly halloween I thought that had to change. I also want to do a few pink mani's throughout October seeing as pink is the colour to show your support in the battle against breast cancer. I had recently gotten Sally Hansen - Pretty in Hot Pink (in poundland) and thought it was such a fun, bright pink. What's even better is that it's got a lot better formula than some of the neon pinks I have (China Glaze - Flip Flop Fantasy and Nails Inc - Notting Hill Gate!) previously tried which usually apply streaky and require a coat of white undies first.. Not this, 2 coats and it was perfectly even. On my ring and thumb accents I used the fabulous Delush Polish - Tonight's the Night from Adrianna's latest "Slice of Life" Collection. 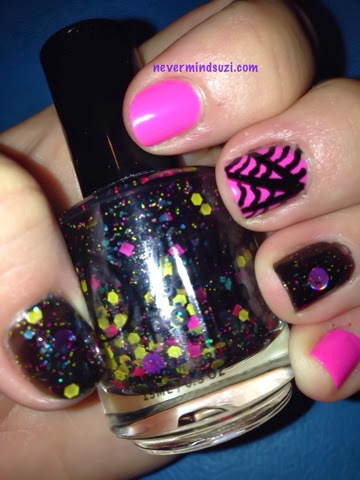 A black crelly full of blue glitters and squares, yellow hexes, pink squares and circles. The circles also have the prettiest hologram effect! 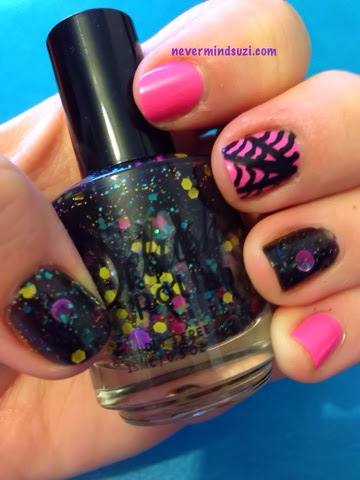 To get into the spirit of halloween I added some webbing (despite my huge fear of spiders) to my middle finger.